Summary: How do teacher leaders work for change within their own schools? What can we learn from writing project teachers’ vignettes that describe challenges as well as features of success? 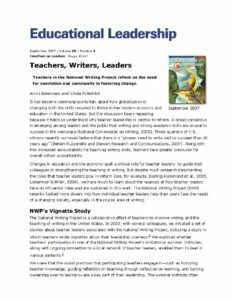 This article, illuminating findings from the NWP Vignette Study, could be useful to read in an institute focused on teacher leadership, collaboration, or advocating for school reform. In addition, new leaders who are supporting colleagues as mentors and thinking partners will find ideas and inspiration for their work in this piece. It has become commonplace to talk about how globalization is changing both the skills required to thrive in the modern economy and education in the United States. But the discussion bears repeating because it helps us understand why teacher leadership is central to reform. A broad consensus is emerging among leaders and the public that writing and strong academic skills are crucial to success in the workplace (National Commission on Writing, 2005). Three-quarters of U.S. citizens recently surveyed believe that there is a “greater need to write well to succeed than 20 years ago” (Belden Russonello and Stewart Research and Communications, 2007). Along with this increased accountability for teaching writing skills, teachers face greater pressures for overall school accountability. Changes in education and the economy spell a critical role for teacher leaders: to guide their colleagues in strengthening the teaching of writing. But despite much research documenting the roles that teacher leaders play in reform (see, for example, Darling-Hammond et al., 2005; Lieberman & Miller, 2004), we have much to learn about the nuances of how teacher leaders take on influential roles and are sustained in this work. The National Writing Project (NWP) recently looked more closely into how individual teacher leaders help their peers face the needs of a changing society, especially in the crucial area of writing.